News about housing, real estate and construction industry. With the proactive policies of the Government of India in the past three years have led to the exponential growth in the affordable housing segment. In fact, the affordable housing has emerged as the most preferred segment. What is more, in June 2018, there was an upward tick logged in the affordable housing segment, thanks to the recent revision of the housing loan limit for priority sector lending (PSL). The Union Government also announced an increase in the carpet area of houses eligible for interest subsidy under the Credit-Linked Subsidy Scheme (CLSS) for the middle-income group beneficiaries. Both the initiatives are going to help the “Housing for All” by 2022 mission and on the other side, the eligibility criteria will increase the involvement in the realty market. The Government of India has eased the carpet area norms for eligibility to provide the subsidy under the PMAY-U. The Ministry of Housing and Urban Affairs announced an almost 33% relaxation for carpet area. The eligibility limit for carpet area had been augmented from 120 square meters to 160 square meters for MIG-I category, and from 150 square meters to 200 square meters for MIG-II category. The CLSS allows beneficiaries to claim interest subsidy up to Rs 2.35 lakh on purchasing a house in these categories. Gaurav Mittal, MD, CHD Developers Ltd., said, “Affordable housing has emerged as the most privileged segment in realty sector over the past three years, courtesy of a continuous government policy push. The Government recent announcement will help the industry to come back on track and the affordable housing will become a lifeline of the real estate sector. Haryana being the first state to encourage affordable housing is now becoming the hub for affordable housing. However in Haryana; Karnal has emerged as the most talked city after it has made into the first list of Smart cities. These government steps towards better housing will create more homebuyers, leading to the establishment of more projects in the future. The developers, on the other hand, will get to sell their stock. According to the industry grapevines, this initiative will bring more attraction to the buyers of metro cities, like prime locations in NCR, MMR and Bangalore and also in Tier-II and Tier-III cities. The increase in the economic activity and elevated demand will create more space in the market. In less than a year, this increase can be seen twice till the current period. While other stakeholders and industry body NAREDCO had been demanding the removal of carpet area cap of 120 sq m and 150 squaare meters from past few times. The ultimate result of these initiatives will work as a boost for both for the homebuyers as well as for the developers. Earlier, the tenure of the CLSS for the MIG category had been extended by 15 months to March 31, 2019. The Union Government had initially intended to implement the scheme for one year. The revision will be applicable from the date of implementation of the CLSS – January, 1 2017. CLSS for MIG-I allows 4% interest subsidy on loan up to Rs. 9 lakh for people with an annual income between Rs 6-12 lakh. Interest subsidy of 3% is given on loan up to Rs. 12 lakh to people with income between Rs 12-18 lakh per annum. A beneficiary can avail subsidy up to Rs 2.35 lakh, and it is applicable for the first-time home buyers till March 31, 2019. Another effective move taken by the RBI was the announcement of the revision of housing loan limits for eligibility for priority sector lending (PSL) from the existing Rs. 28 lakh to Rs 35 lakh for metros and for other cities from the current Rs. 20 lakh to Rs 25. lakh. The overall cost of the dwelling unit in the metropolitan centre (with a population of 10,00,000 and above) and at other centres should not exceed Rs. 45 lakh and Rs. 30 lakh, respectively. Apparently, the move, along with the Union Government decision agreed to use the surplus land of sick PSUs for the construction of affordable units, will expand the field of affordable housing across the country. The only result to this move is the increased availability of housing sector in the primary as well as resale markets. Homebuyers and the realty market are real beneficiaries as a large number of homebuyers will now be able to avail benefits under PMAY-U triggering sales. Is rental housing nearing its doom days in India? Off late, Indian real estate sector has been going through a thorough revamp phase on the policy reforms front and mega announcements with respect to infra upgradation in the country. All this has been a recent addition for the realty sector that plans to revolutionise it. Housing for All has been a jargon for almost two years now and the public has been looking up to the government and the private sector to offer a roof over everyone. At present, people reside in two ways, one in their own abodes or second, in a property bought by others for which some amount is to be paid each month; in simple words, rented accommodation. Now, price factor is the only concern in India where public and private sectors need to cooperate and come out with a solution, i.e. low cost housing. Affordable housing will definitely address to this need but at the same time, if the cost of EMIs can beat the rent per month, then why won’t people go into buying homes rather than staying on rent? So, is rental housing nearing its doom days in India? “India has a housing shortage by almost two crore units where more than 90 percent accounts to economically weaker sections and low income groups. At the same time, major realty regions across India are witnessing over supply of units by almost 7,50,000 throughout NCR, MMR, Bangalore, Chennai, Pune and few others. Thus, Indian realty market is in dire need of low cost housing and the moment private sector and government come out with such assignments, there will be a major supply of affordable units across the nation and the demand will be well met. This in turn can take rental housing demand for a ride as people will then have a property that they might be able to afford and there is nothing better than having a home of own”, explains Rupesh Gupta, Director, JM Housing. Rental real estate market has served as a backbone for the Indian realty sector for decades and it has significantly contributed towards the growth of the realty sector. But as the affordable housing segment grows, rental housing aspect will be on the losing end. Commercial rental realty market is still in its growth phase as commercial real estate is still catching pace in India. But rental housing segment now falls in danger as people will be able to buy a property and not required to rent one. “Even in the budget speech this year, major incentives were offered for affordable housing and rental housing. As the demand for affordable housing gains momentum, there will be an inverse relation visible for the rental housing as there will be no takers for the rental accommodation once people have properties of their own. In either cases though, real estate sector will be the winner”, avers Ankit Aggarwal, CMD, Devika Group. The government is also working diligently to cater to the housing needs of the public and therefore, the Union Budget 2016-17 had a bouquet of incentives in offer for affordable housing and rental housing. For the the first time homebuyers, government has offered an additional deduction of Rs. 50,000 per annum for loans extending upto Rs. 35 lakhs sanctioned in 2016-17, where the cost of the house does not exceed Rs. 50 lakhs. On the other hand, HRA deduction has been raised by Rs. 36,000 under Section 80GG, thus promoting rental housing as well. “The real estate scenario in our country will very soon land in fix, where affordable housing will be in trend and there will be no tenants that might reduce the investors and second time homebuyers base. Once everyone has a roof of their own, then why will somebody desire to put up in a rented property? When affordable properties will be in abundance, there will be a direct battle between EMIs and monthly rents, whichever costs less will attract the resident there. There might then come a time when commercial real estate will witness a boom in demand and see better days as future of housing will get completely secured”, states Deepak Kapoor, President CREDAI-Western U.P. & Director, Gulshan Homz. In fact, from the developers’ perspective, the Budget speech has been much more favourable if we speak about affordable housing construction. Developers building affordable housing projects will not attract any taxes on the profits earned. “By offering various benefits to the developers considering affordable housing, the government has proved its focus area and this in turn can help promote housing demand in near future. Even the new entrants have a lot to cheer about plus, this will also make several entrepreneurs plan a business in real estate. Few years down the line, we are predicting a boom in housing but, a gradual decline in rental housing market”, enlightens Rahul Chamola, MD, One Leaf Group. Shriram Automall India Limited (SAMIL), an ISO 9001:2008 certified firm with AA rating from CRISIL, has forged a strategic alliance with TATA Capital Housing Finance Limited (TCHFL), a housing finance subsidiary of TATA Capital Limited. As per the agreement, SAMIL will provide ‘End-to-End Bidding Services’ for disposal of TCHFL’s housing properties with its extensive experience and wider reach, a statement issued by SAMIL said. From (L-R): Samir Chakraborty (National Functional Head – Housing & Mortgage of SAMIL); Sudeep Kumar Banerjee (National Head – Business Development of SAMIL); Ranjit Dash (Legal Manager of TCHFL) and Sachin Saxena (National Collection Manager of TCHFL). In accordance to the MoU signed on February 11, 2015, SAMIL will conduct regular physical and online bidding events, specifically catering to the Residential Property Segment of TATA Capital Housing Finance Limited. The Company already holds a strong position within the pre-owned vehicles and equipment sector of India through its complete services and multiple bidding platforms. Known for maintaining complete transparency within transactions, it has promised value-for-money deals which will be strongly based on ethical grounds. SAMIL has an online bidding web portal – bids.samil.in, which conducts regular bidding events, every month. Moreover, the Company has also developed a new web portal – property.samil.in, which will purely conduct online bidding events, specifically catering to properties. This portal will play an effective role in disposing different properties of TCHFL with its huge customer base, across India. Tata Capital Housing Finance Limited (TCHFL), is a wholly-owned subsidiary of Tata Capital Limited (TCL), and is registered with National Housing Bank (NHB) to carry on housing finance activities. The Company offers a range of Housing Loans and Loans against Property to various segments of society including salaried individuals, self employed individuals, self employed professionals, non-individual entities, etc. and has been focusing on business opportunities available within the Tata ecosystem. Apart from Housing Loans and Loans against Property to the retail segment, TCHFL also provides project finance loans to developers. The Company intends to keep growing its business at a healthy rate, with Rural and Affordable Housing Finance, as one of its focus areas. Shriram Automall India (SAMIL), one-of-its kind facility, is a wholly owned subsidiary of Shriram Transport Finance Company (STFC). It is India’s first ever service provider that offers various well organised and transparent bidding platforms, including physical, online, one stop classified and negotiated deals, for acquisition and disposal of pre-owned commercial vehicles, construction and industrial equipment, tractors and agricultural equipment, buses, passenger vehicles, three wheelers and two wheelers. The company also provides various allied services, including New Look Refurbishment services, valuation, parking and finance (through STFC). It has successfully launched more than 100 bidding locations, including over 45 well-structured Automalls and nearly 70 strategic parking locations, across India. The company has been awarded ISO 9001:2008 certification for its Quality Management System and rated AA from CRISIL. Investing in real estate constitutes largely to identify the right opportunity. The key factors to look for investment are requirements, appreciation, value and various reasons – One of the crucial ones being – the city and the area. There are various cities in India that are favourable from investment point of view. One of the cities that is into the radar is the cultural centre of Gujarat – Vadodara, says Pankaj Srivastava Chief Operating Officer, Maitreya Realtors & Constructions Pvt Ltd.
Pankarj Srivastava, Naresh Kanodia and Janardhan Parulaker at the inauguration of Maitreya Paradiso at Vadodara. Maitreya Realtors & Constructions Pvt Ltd (MRCPL), the construction arm of the Maitreya Group of Companies, started in 1998 is a real estate company engaged in the business of commercial, residential and retail projects. Under the leadership of its CMD, Varsha Satpalkar, the company currently focuses on construction and development of real estate properties across the states of Maharashtra and Gujarat. 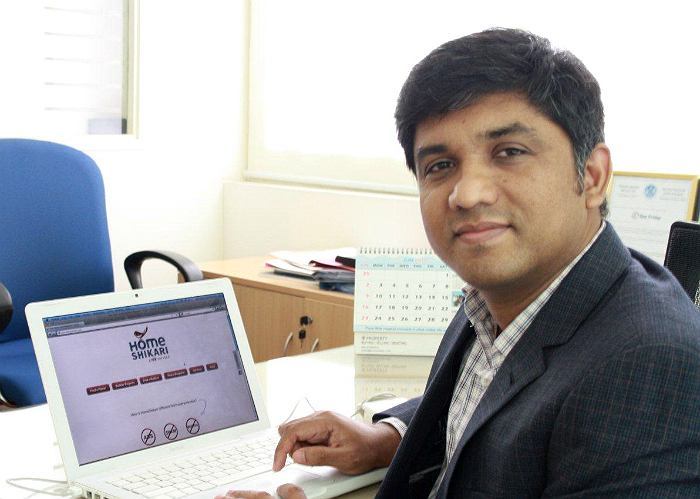 The acumen of Pankaj contributes largely to the success of the company. With the proud track record of building trust and delivering values to all its stakeholders, MRPCL is poised to become a leading brand in the real estate sector. The company is recognized for its quality, sustainable projects, transparent deals, timely delivery and services for all income groups. Its strategic alliances and partnerships, as well as highly competent in-house team, enables the company to undertake and smoothly execute construction of high-end bungalows, villas, residential apartments as well as shopping malls across the country. To its credit, the company has several sophisticated myriad housing projects in various cities of Maharashtra such as Pune, Aurangabad, Vasai, Dhule, Jalgaon and Sangli, to name a few; while it has also constructed several commercial projects in Mumbai, Sangli and Kolhapur. Maitreya Greens – It is the first ever IGBC Gold pre-certified green project in Nashik. Spread across ten acres of lush green land, of which only 40 percent would be developed into six residential towers. Comprises of Ground plus 14 floors, these towers are constructed in a complete eco-friendly manner. Maitreya Pandav Van – Located beside famous Pandav Caves, Pandav Van is a 40 Exclusive 2 BHK Twin-bungalows Scheme. Each bungalow comes with a private garden, car parking, balconies and terraces, planned in a way that it ensures full privacy and at the same time offers lot of open space. Maitreya Sankul – Located amidst lush green landscape of Pathardi, Maitreya Sankul is a residential project that comprise of six storey buildings offerings 2 BHK spacious flats that easily fits into the budget of middle-income families. Maitreya Sunrise – A perfect combination of commercial and residential units, Maitreya Sunrise consists of 62 residential apartments, 39 shops and 10 godowns. This finest complex is constructed at a prime location in Sangli which is well connected to railway station and bus stand. A veteran for over 20 years in real estate sector, Pankaj is responsible for strategic planning and managing overall business operations of the company. He started his career as an Assistant Civil Engineer at Continental Constructions Limited following which he joined Larsen & Toubro Ltd as a Civil Engineer for a span of five years. His stint as a project manager in Gherzi Eastern Limited and Macquarie Real Estate helped him climb the ladder. In July 2010, Pankaj joined Tata Housing Development Co. Ltd as General Manager – Engineering after which he earned the designation of Vice President with Octamec Engineering Limited. Today, Pankaj has successfully established Maitreya Realtors & Constructions Pvt Ltd by managing the company’s day-to-day operations smoothly. With a sound knowledge of statutory, municipal rules and regulations and labour laws, strong technical and commercial acumen, experience in macro and micro level planning and ensuring contracts are administered effectively and efficiently, Pankaj has capitalised the stature of Maiterya Realtors & Constructions Pvt Ltd in the real estate space. His scheduling and implementing construction projects by ensuring development of integrated Program Plan that addresses contingency and minimises interruptions and provides safeguards against project over-runs and implementation of project control has resulted into rapid expansion. A Post Graduate in Civil Engineering from Birla Institute of Technology and Science – Pilani Rajasthan, has also attended a Short Term Course on Sesmic Designs from IIT Kanpur and course on an Internal Auditor for ISO Systems – BIS. 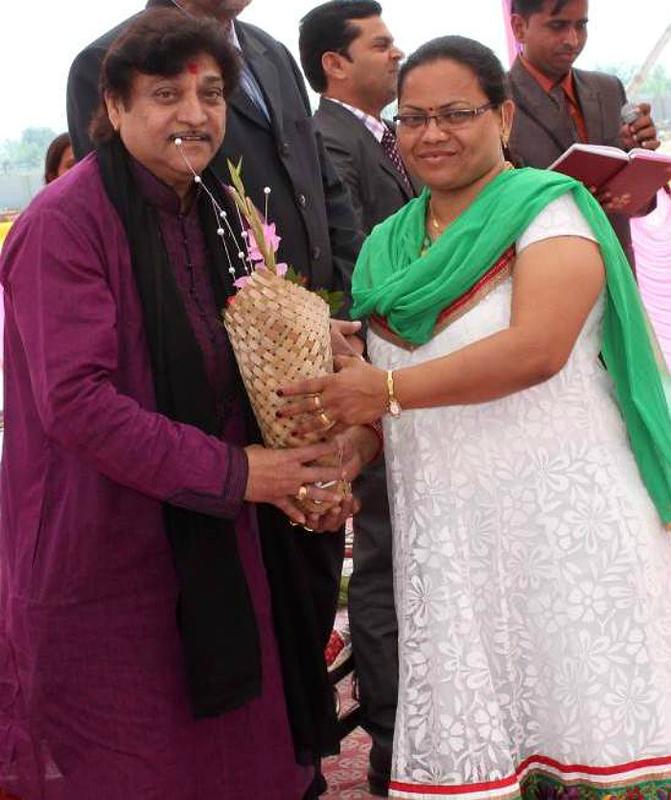 Naresh Kanodia at the opening of Maitreya Paradiso at Vadodara. JM: What are the reasons which define Vadodara as a favourable investment destination? PS: Various reasons secure defining Vadodara as a favourable investment destination. To mention a few, the city is emerging as an IT hub. There are major infrastructural developments planned in the city coupled with the industrial areas, which shall lead to improved connectivity to the city and increased employment opportunities within and around the city. The Delhi-Mumbai Industrial Corridor passes through Vadodara, making it a key destination for attracting industrial investments. Gujarat’s leading educational institutions are located in Vadodara, offering skilled and intellectual manpower in abundance for various industries and R&D activities. Interestingly it is an ideal destination for the Non-Resident Indians (NRIs) to settle down as well. It is also an emerging hub for various glass manufacturing companies and automobile ancillary plants. Various towns are home to Pharmaceutical and other Chemical manufacturing ventures. Vadodara is home to a large number of reputed large scale industries and public sector units like Indian Petrochemicals Corporation Ltd (IPCL), Oil and Natural Gas Corporation (ONGC), Gujarat Alkalies and Chemical Ltd (GACL), and Gas Authority of India Ltd (GAIL). A large number of builders have also become a major part of Vadodara real estate. JM: Can you talk about Maitreya’s projects in Vadodara? PS: Maitreya Realtors & Constructions Private Ltd (MRCPL), the construction division of the Maitreya Group of Companies had launched its premium plotting project near Ajwa Funworld in the name of Maitreya Paradiso. Maitreya Paradiso is located at the Rasulabaad Jharod crossing, before Ajwa Funworld. Surrounded by lush greenery, the project entails 120 plots ranging from 1800-8000 square feet targeting a range of buyers depending upon their choice and preference. Customers can buy these plots and construct their desired villas as per the standard elevation and specifications. The Infrastructure that includes a attractive designed compound wall, grand entrance plaza, internal roads, electricity and water connections to individual plots, storm water drains, Sewage treatment plant, soft water supply and an elegant club house. PS: It is a unique venture for those who wish to invest in land parcels or for those looking for their second home or thinking about their retirement homes. One can buy the plot and construct home as per his requirements. With the urban development authority of Vadodara continuously encouraging many construction companies to establish residential areas, IT parks and shopping malls within the city, the city promises a bright future not only for itself but also for those who intend to draw on the prospects of an emerging cosmopolitan. HARMAN International (India) joined hands with renowned nonprofit organisation Habitat for Humanity, for its ‘Women Build’ project leading up to International Women’s Day, according to a statement issued by HARMAN. 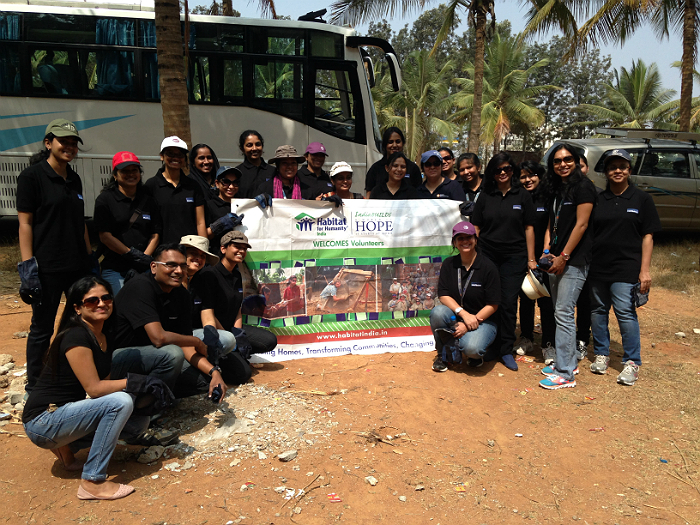 Over 40 HARMAN India women employees came together in solidarity in an effort that is aimed at the elimination of poverty housing. One of the objectives of Women’s Day being celebrated all over the world is to provide support for vulnerable women living in urban slums and empowering them with safe, decent and affordable homes. This ‘Women Build’ project initiated by Habitat for Humanity aims to achieve this in one of Bangalore’s peripheral slum resettlement colonies in Hegde Nagar, providing shelter and dignity to vulnerable women along with their families. Vinita Srivastava – Director HR, HARMAN India said: “HARMAN India is delighted to partner with Habitat for Humanity for their ‘Women Build’ project. There is an overwhelming requirement to pay attention to women’s concerns in our country and this volunteering event addresses the primary issue of housing. I am happy that we are able to come together as strong, capable women of today, to do our bit to re-instill hope in our community”. “Women Build is a project wherein we create a bridge between those with the means to support with them that are in need. Habitat for Humanity looks beyond shelter to pave the way for the development of a community. We believe in transformation of communities through volunteering and this is one such initiative. When people come together to help each other, it always has an immensely positive effect. HARMAN has supported our efforts in rehabilitating victims of Uttarakhand and now, we have all women coming forward playing their part in construction of homes for the underserved. Our communities are overwhelmed with joy and gratitude to see the commitment of HARMAN to the society”, Nirmala A, Regional Head for partnership development, South India, Habitat for Humanity said. Habitat for Humanity builds, rehabilitates and repairs simple, decent, affordable homes in sustainable communities with support from homeowner families, volunteers, donors and partner organizations in more than 20 countries across the Asia-Pacific region. For more information visit : habitatindia.in. HARMAN (harman.com) designs, manufactures, and markets a wide range of infotainment and audio solutions for the automotive, consumer, and professional markets. It is a recognised world leader across its customer segments with premium brands including AKG®, Harman Kardon®, Infinity®, JBL®, Lexicon®, and Mark Levinson® and leading-edge connectivity, safety and audio technologies. The Company is admired by audiophiles across multiple generations and supports leading professional entertainers and the venues where they perform. More than 25 million automobiles on the road today are equipped with HARMAN audio and infotainment systems. HARMAN has a workforce of 14,800 people across the Americas, Europe and Asia and reported sales of $ 4.7 billion for the last twelve months ended December 31, 2013. Though, Bhiwadi is known for low and middle income housing, the next real estate boom town after Gurgaon, however, with the launch of Tree House Residences – an all luxury apartments by Ashiana it has slowly entered the map of luxe housing destination. 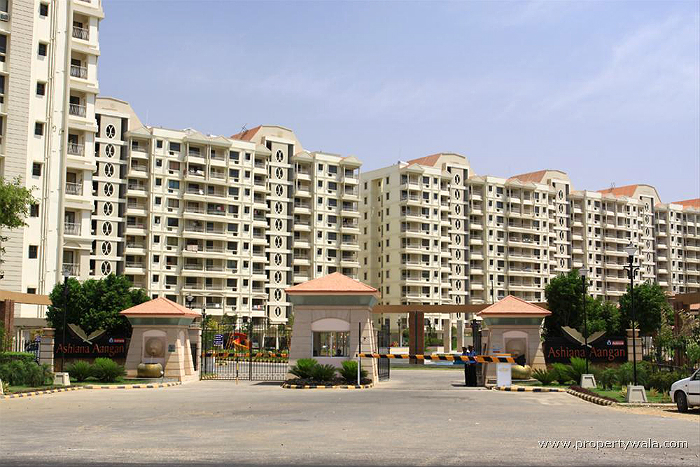 The sample flat of first such luxury project is ready and shown to selected audiences on March 2, 2014 during Ashiana Housing’s know your neighbour initiative, according to a company statement. ‘Tree House Residencies’ in Bhiwadi for those who desire to live a statement-making lifestyle but cannot afford one in Delhi and Gurgaon. The apartments are for those who believe in living with the state-of-art facilities. It is an exclusive, niche, stylish project with top-notch amenities for the modern buyer who aspires for a quality life. 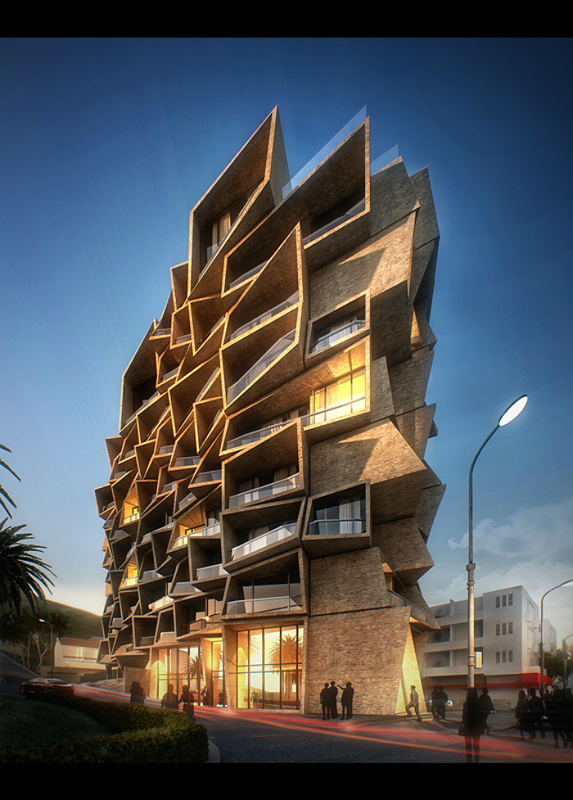 The project consists of thirty six extravagance apartments. Total of nine stories in four towers spread in the area of one acre land; each apartment is designed to provide grand life style, maximum comfort and convenience. These are high-end apartments with a choice of thirty-four 4BHK apartments in the area of 3255 square feet and two 5BHK apartments in the area of 3755 square feet. It guarantees excellence in the living archetype with a wide range of facilities like, in-house gymnasium, children’s playing area, community hall and much more. They have ensured that everyday living is a pleasure at Tree House Residences with the membership of well-equipped facilities at Treehouse hotel, spa and club. Among others, Tree House Residency customers will have access to the club, with facilities such as swimming pool, spa, food courts, gym, sports bar, rest­aurants, tennis court, business centre, For safety, it will have high-level security with fire sprinklers and fire hydrants. Vishal Gupta, Managing Director of Ashiana Housing says: “We share a very special bond with the place Bhiwadi. Our every project in Bhiwadi seeks to bring about a constructive transformation in the lives of millions and build a world into the land of serene coexistence for every resident. The Tree House Residences will fill in the gap prevailing in luxury segment between Gurgaon and Bhiwadi”. Achieved a lot globally, yet remains a very private and understated South Bombayite. With his classic sensibilities, he is an avid traveller, known more in Milan or Italy than within his own turf. 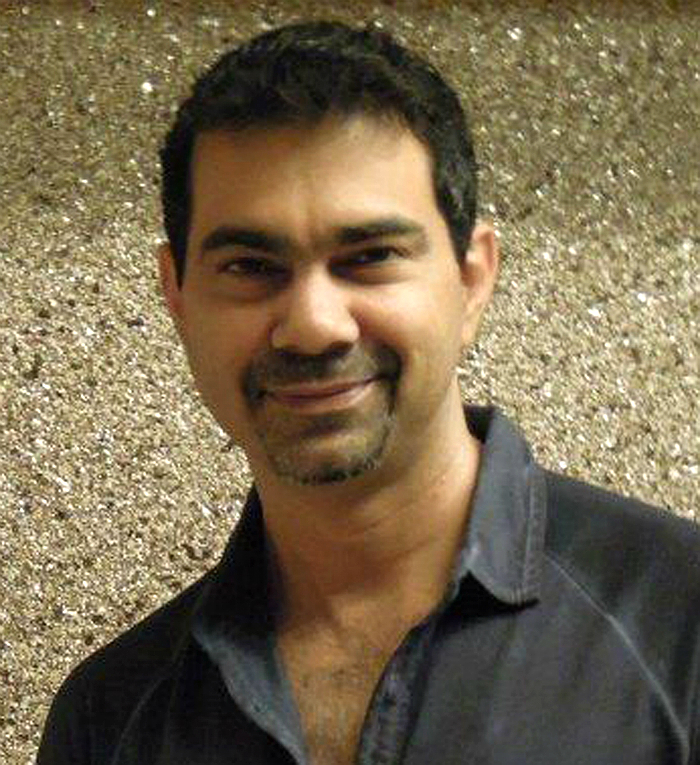 That is Sanjay Puri, the world renowned architect for you. 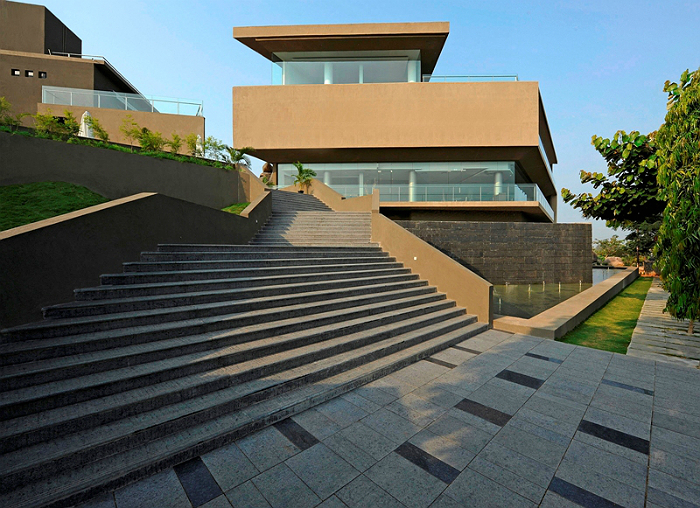 Sanjay is a brand in himself and he is the only Indian Architect to will 33 coveted international awards. In fact, he is the only person in the world to have won three awards at MIPIM in March 2013. The MIPIM is the equivalent of the Cannes in the field of architecture and design. Sanjay’s project, ‘DCaves’ in Hyderabad has won ‘The Most Sustainable Hotel in the World’ at the A+ Awards in New York last year as well. 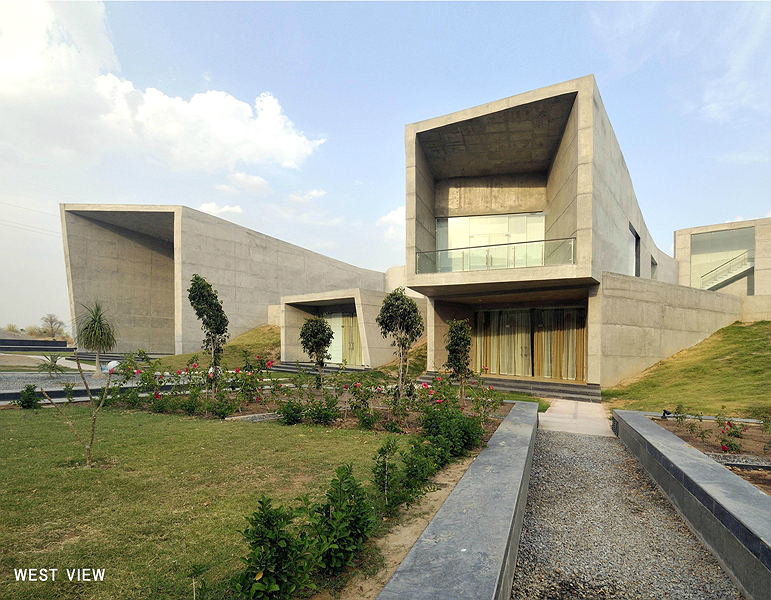 Sanjay Puri and Associates, his firm is known not just for interesting designs, but also for contextual architecture. 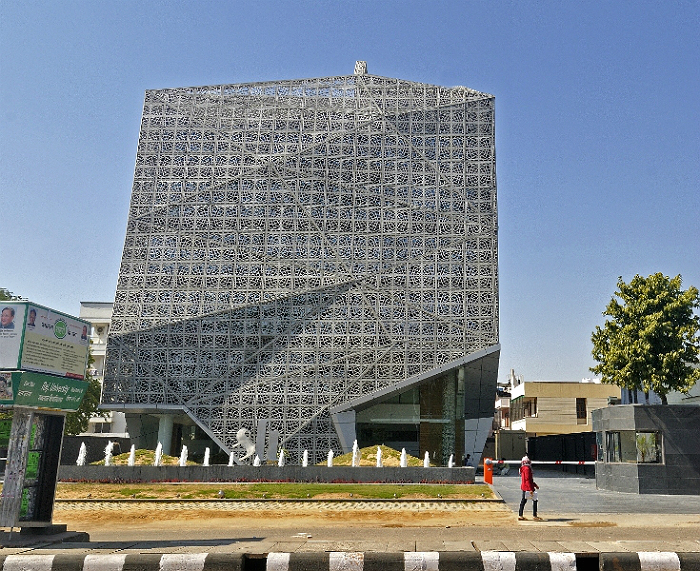 For instance, 72 screens in Jaipur takes its inspiration from the old traditional ‘jali’ screens of the architectural heritage of the region sheats the building on all sides further reducing the heat gain and rendering the building very energy efficient. Also, the Courtyard House in Rajasthan is relatively large house, due to the client requirements, is designed in response to the desert climate of its location and is built sustainably with natural ventilation being facilitated throughout the house and minimised heat gain to increase its energy efficiency. 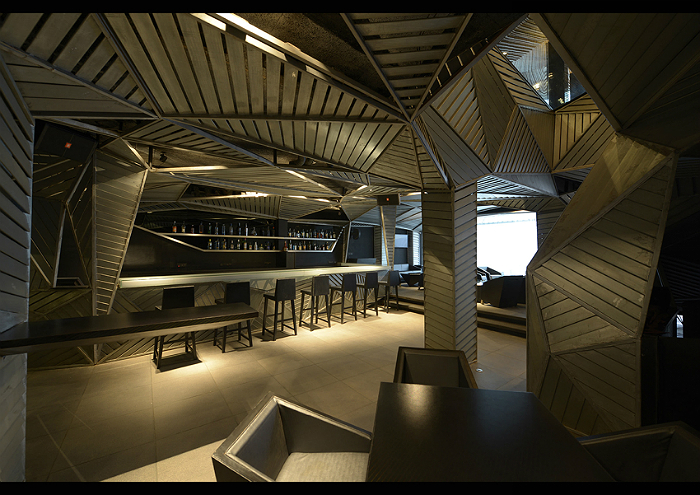 Few of his most prominent projects include the Chrome Hotel in Kolkata, DCaves Hotel in Hyderabad, H Hotel Lucknow, The Courtyard House in Rajasthan and more. Sanjay was also in the news lately for the Bombay Arts Society, which was launched in October last year. 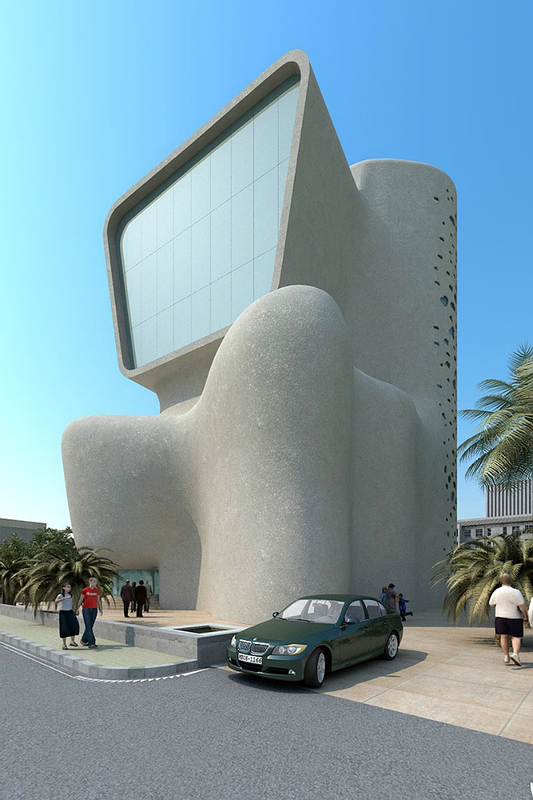 Globally, the firm’s biggest and most noteworthy projects include the Chapel at Murcia in Spain and Teresa 153 in Montenegro. Sanjay, not known in many social circles in India has been featured in over 200 international publications. It is not every day that one gets to be in the presence of sheer creative genius, which is nothing short of inspiring. One such personality is Sanjay Puri, who has silently but surely been working his way to become the leader in architecture and design in the country. JM: Can you talk about your education and the eventual beginning of your tryst with Architecture? SP: After finishing my graduation from Mayo College, I went on to pursue my dream of becoming an Architect and studied from the illustrious Academy of Architecture, Mumbai. My tryst with Architecture began at an early age and my formal training in the subject which gave me the means to channel my creativity in a productive manner. Like all creative minds, I find inspiration everywhere. Of course my biggest inspiration and something that I turn turns to even today is ‘The Fountainhead’ by Ayn Rand. This novel that is one of the greatest books of our times revolves around the life of the protagonist, an Architect who is so driven that he would rather struggle than compromise on his artistic vision. This is the mantra that I follow till today and is the thing that sets me apart from other Architects. JM: Can you talk about your earlier career? SP: I began my career by working under the Master Architect of my time: Hafeez Contractor, who taught me a lot of what I know on the subject. 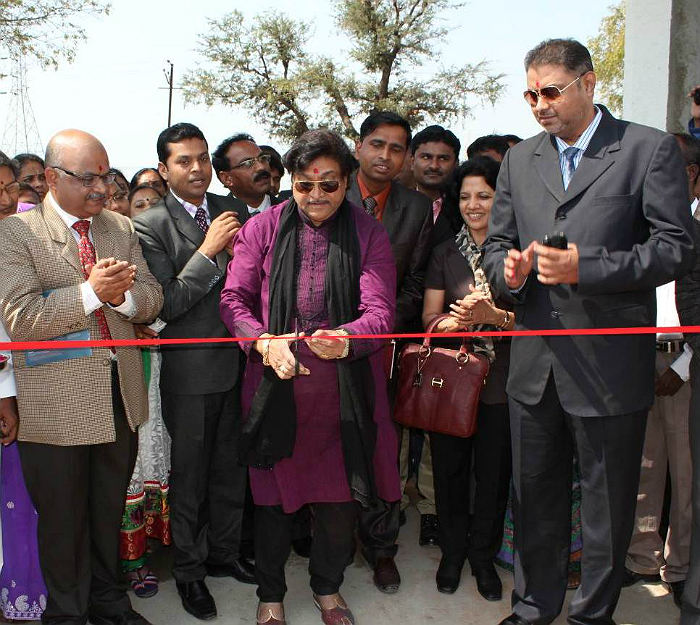 Subsequently, I went on to establish my own firm and in 1992 Sanjay Puri Architects was born. From then on there was no looking back. Today I am at the forefront, leading my impressive team of more than 72 employees in several projects in India and around the world. JM: Your avant-garde architectural style is truly unique and a true expression of your creativity. What is the essence of your design theory? SP: The essence of my design theory is creating innovative design spaces that are contextual but at the same time sustainable. 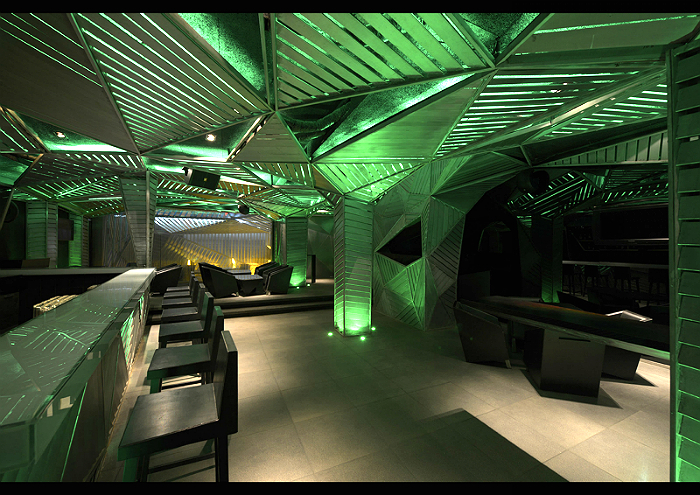 The main aim is to evoke an exhilarating experience while infusing functionality effectively. JM: Today you are the leading architect in the country with a name in India as well as overseas. You are the only architect worldwide to win awards in three categories at the latest MIPIM Architectural Review Future Projects Awards in France. Besides this you have also bagged over 33 international awards and numerous national awards garnering fame for yourself and your firm. How can you still be simple and down to earth? SP: By nature, I am quite a simple and straightforward man, and do not believe in unnecessary embellishments on buildings. I prefer to focus on the form of the structure and pay more attention to the way the building feels and not just how it looks. I also do not look like a man who will allow success to go to my head and has managed to remain humble and unassuming in spite of having appeared in over 200 international publications and being a speaker in architectural events in Italy, Spain, Singapore, Serbia, Mexico and The Netherlands. JM: Please describe your work? SP: My utmost preoccupation is to evolve innovative design solutions and incorporate the geography of the location in a positive way into the design. Most of my designs have an element or principle of traditional Indian architecture that I try to imbibe in them in my own way. While designing a space, the most important thing to remember is not to hold back, to let your creativity flow undeterred. This is something that is missing in the run of the mill buildings that we see cropping up everywhere nowadays. I try to ensure that every structure I design and create is vastly different and unique from the previous one, and avoid repetition at all costs. JM: Can you talk about Sanjay Puri Architects? SP: Founded in 1992, Sanjay Puri Architects (SPA) today is one of the most sought after architectural and design firms in India. With a team of over 72 employees, the firm is an unmatched powerhouse of design. SPA has an extensive design portfolio that includes architectural and interior design projects in fields like hospitality, commercial, retail, educational and entertainment facilities as well as large urban projects and town planning. Currently we are involved in designing over 100 projects in 40 cities across India as well as projects in Montenegro, Spain, UAE and Mauritius. SPA have won 34 International awards including the Chicago Athenaeum Museum of Architecture & Design’s International Architecture Awards 2012 & 2011, the World Architecture Festival Awards 2012, 2011 & 2010 , nine MIPIM Architectural Review Future Project Awards & 5 World Architecture Community Awards, UK and two Hospitality Design, New York Awards. We also have innumerable national awards to our credit. 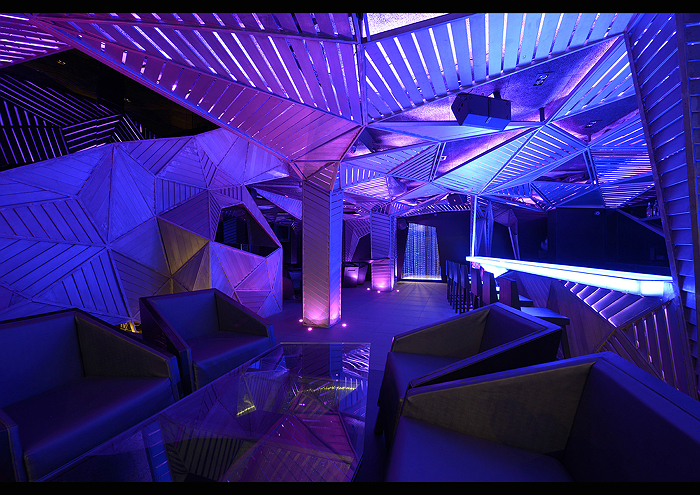 Some of the firm’s most notable projects include the Chrome Hotel in Kolkata, D Caves Hotel Hyderabad, D Hotel Lucknow, 72 Screens Jaipur, The Courtyard house Rajasthan and Bombay Arts society. Internationally the firm’s biggest and most noteworthy projects are the Chapel at Murcia Spain and Teresa 153 in Montenegro. Journalist, writer, foodie, musician, travel buff, all rolled into one, that is Namrata Kohli for you. Namrata is a well known writer and journalist who has written extensively for domestic and international media. 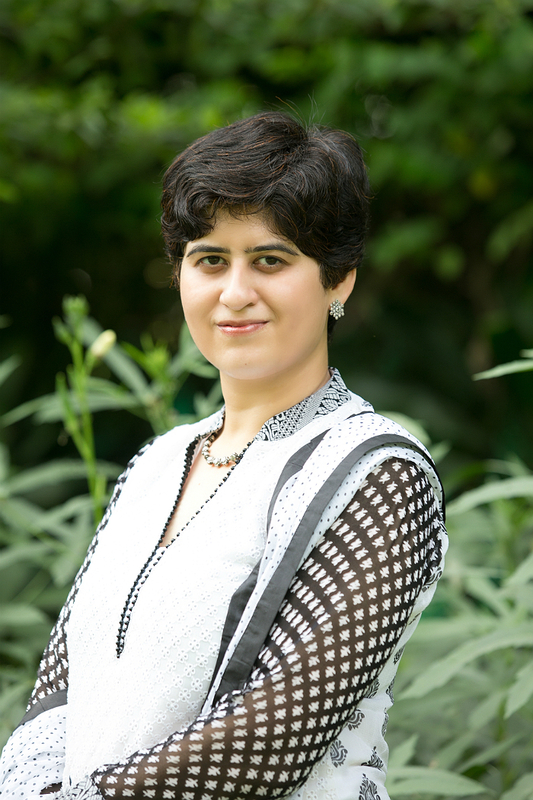 Especially known for her coverage of real estate issues, Namrata’s work has been published in leading publications such as The Times of India, Economic Times, Property Report Asia, and Gulf based magazines. Namrata started her career by working with Bennett Coleman and has written on lifestyle, education, food, healthcare and travel. 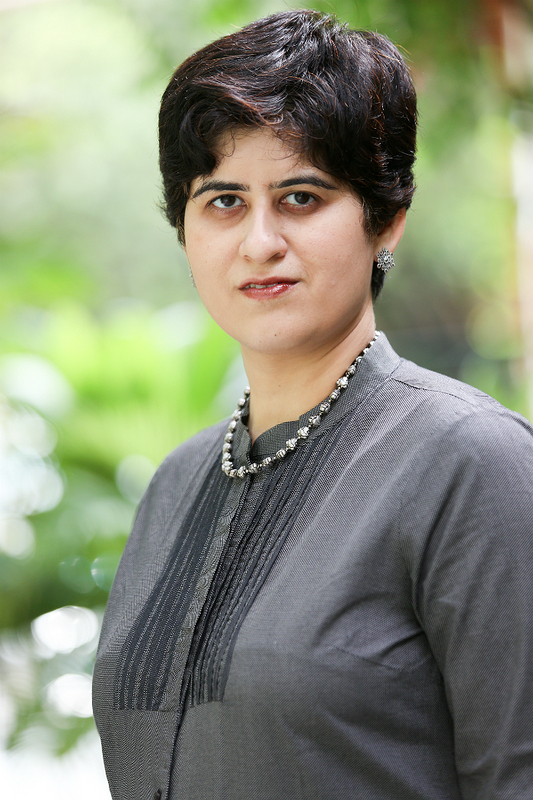 Recently, she edited “Indian Realty Year Book’-a one of a kind coffee table book on Luxury Real Estate with publisher Hundred Communications, in October 2013; which was featured on NDTV Profit. When not spinning a yarn with words, she loves to infuse her creative energies into food, music or travel. A self confessed foodie, when not eating her mind is still on food – how by she loves to be ‘concocting meals.’ Playing harmonium and exploring new travel destinations are other passion of her life. Namrata is a silver medalist in english literature from Delhi University and has done her mass communication from Indian Institute of Mass Communication. (IIMC) She was selected for a special Executive programme at Indian School of Business (ISB) Hyderabad, recently which was sponsored by Goldman Sachs. In a pioneering effort, publishing company Hundred Communications has come out of a first-of-its-kind coffee table book on luxury real estate. Indian Realty Yearbook (IRY), the exclusive publication maps the universe of luxury real estate in India. Presenting a snapshot of the Indian luxury market, the book gives a guided tour of key projects in the luxury and branded home segment; cruising along the latest trends and introducing the-best-in-class luxury accessories, gadgets and gizmos. In short, IRY has everything to aid and abet the investor, in his business of cherry picking a home. Delving into insights that go beyond just ‘facts’, the book deftly captures the ‘facets’ and the essence of luxury. It tries to define luxury in the Indian context, where the luxury residential market in India is headed and the distinguishing characteristics of the Indian luxury home buyer. Informative, insightful and perceptive this coffee table book is supplemented by impactful images that make it a visual treat. But the highlight of the book are perspectives shared from globally acclaimed names on several aspects of Indian luxury real estate – the world’s best, have converged onto one exclusive space ‘By Invitation Only’. Their views ‘quote unquote’ on design, architecture, construction, engineering aspects add value and appeal to the book. Today, global leaders are betting big on India’s luxury real estate market- Swarovski is seen lending its shine to Indian real estate, Trump giving its trademark to Indian projects, Armani and Versace interior designing of Indian homes, Greg Norman creating premier signature golf courses, Philippe Starck making its foray- we can confidently say that India is where the best minds in luxury space are converging today. Nobody wants to miss a chance of being in India after China, which went from Mao suits to Armani and a ‘luxeplosion’ of sorts in the last decade. IRY was launched recently by actor Chitrangada Singh, Soha Ali Khan and boxer Vijender Singh at an exclusive event of Indian Realty Awards 2013 held at Hotel Lalit, New Delhi. It was a televised event covered by NDTV Profit. Hundred Communications (P) Ltd is the name behind some of India’s finest coffee table books across the fields of luxury, fashion, lifestyle, wedding, real estate among others. This boutique publishing house is known for its top end publications. Some of the annual publications include premium fashion guide- Fashion Resource Book and The Great Indian Wedding Book, a luxury coffee table book on signature weddings, launched by Sonam Kapoor last year. JM: Tell me something about your latest launched coffee table book- IRY? NK: Indian Realty Yearbook (IRY) is a coffee table book that encapsulates the luxury end of Indian real estate market. India is seeing the advent of branded homes in the organised space – as you know Grand Hyatt Branded Residences, Armani/Versace/Swarovski homes are being launched now, as also the Trump homes, Four Seasons Private residences- all this indicates an appetite for luxury in Indian real estate. These trophy homes or luxury homes celebrate the coming of age of Indian residential real estate. India has recorded the second highest population of HNIs in the world, and logically the first aspect that gets an up gradation is the living space. There is demand and hence there is supply. Slowly but surely, the story of luxury homes has begun and we felt the urge to document it. Our book aims to be a ready reckoner for anyone looking to buy in this segment, as also create in this segment- in that sense it is targeted at the HNI, as well as the industry stakeholders such as the developers. JM: You are a well known journalist and writing for leading english daily of India, so what prompted you to undertake editing of IRY? NK: I believe this was an exciting opportunity at the right time. I have been tracking real estate for last few years and have developed some insights and interest in this sector. Moreover luxury segment in the real estate sector had not been documented so far in a single place. As they say.. opportunity comes disguised as hard work – you just need to recognise it. JM: India is the fastest growing economy, luxury segment is on rise, but still malls are craving for more sale conversion. Whats your take on this? NK: True – sales conversion is not adequate. However, there are many high performing retailers, though there are many more under performers. India is a challenging market and one cannot use a cookie cutter approach to succeed here. I feel catering to the Indian buyer is not so easy. We have a certain culture, a set of values and brands that sustain in the long term are those that respect and understand the consumer. The Indian buyer may have a huge appetite for luxury but is value conscious. We may be lavish in taste but discreet in purchase. So, a good brand spends a lot of time understanding the consumer mindset – and evolves itself soon – just copy paste from a foreign market does not always work. As you can see, Mc Donalds sells lots of Aloo Tikki burgers and even KFC serves veggie burgers – these brands have tailored themselves to the market and hence are doing well. JM: What were the key deciding factor before showcasing any luxury brand in IRY? NK: To be able to qualify for the book, the brand had to be one with a proven track record, a good reputation and credibility. Two, a presence and interest in India was mandatory – however global in scope, it was important for the brand to have executed a project or be in the stage of execution. For example Foster + Partners is a well known architecture firm and now they are implementing the Ireo township at Gurgaon. Likewise for John Hitchcox’ yoo design studio – their designers such as Jade Jagger and Philip Starcke have designed homes in Pune and Mumbai. There were some brands not ready to talk, yet, about their work, and we respected that – they should feature in our second edition. JM:What are your future plans? Apart from Indian Realty yearbook, when do you plan to write some book? NK: A writer breathes through writing – I will embrace just about any project that offers creative excitement and makes for an interesting read. This could range from traditions rooted in the past to the present contemporary issues, the cultural and social milleu, travel and traditions, tourism and weddings – anything that pushes the boundaries of thought and expression. We live in such dynamic times that there is a lot to talk about. JM: What were the key external factors impacting the residential real estate market in 2013? SP: The year 2013 saw a lot of key external factors affecting the residential real estate market. RBI guidelines, revisions on FDI, the draft Real Estate Regulation and Development Bill and a volatile economy are among a few. JM: Will the proposed Real Estate Regulation Bill create any positive impact on the Real Estate horizon in India? SP: The Real Estate Regulation and Development Bill, can be seen as a positive change towards a more organised and transparent approach to real estate in India. But with elections coming up, the fate of the Bill and its current form faces an uncertain future. JM: Has the RBI guidelines on funding created a negative impact on builder cash flows? SP: The change in RBI guidelines on the 20:80 funding has had a serious impact on builder cash flows. Most builders have highly leveraged balance sheets and the slowdown in demand has led to a serious pile up of inventory in most cities. JM: What are the other deterrents for overseas investors in shying away to foray into Indian market? SP: Transparency issues and associated risks with the residential real estate market too act as a deterrent for foreign investors. The REIT market for commercial real estate is just beginning to see some action. In the current scenario, organised bulge bracket investors see commercial real estate more favourably than the residential market. JM: According to you, which category will see the highest demand in the outlying and newer areas of the city? SP: The budget homes category will witness the highest demand in the outlying and newer areas of the city, especially because there is a good deal of price flexibility that developers display. The locational preferences are based on factors of affordability, followed by urban and social infrastructure to support living. Yet, within each of these sectors, price is still seen as the largest pain point amongst buyers. The investment market will therefore see less traction than the end-user market. JM: Do you think the foreign investments into the commercial sector are likely to increase any time soon? SP: Yes, foreign investments into the commercial sector are likely to increase with the formation of REITs. Commercial office spaces with long term lease agreements are going to attract more such investments. Growth is expected to be muted until a new Government is formed at the Centre after elections. Cities with large pile up of inventory like Mumbai, NCR and Chennai are likely to witness a slow down. Some pockets within NCR like Greater Noida may do well. Bangalore, by far is expected to outperform all other markets in 2014. Pune is expected to do reasonably well. Hyderabad has witnessed lackluster performance in 2013 due to the political uncertainty over Telengana row, but may see some renewed buying as things become clearer and since the market has almost bottomed out. JM: How about the luxury and super premium segments? SP: In the luxury and super premium segments where buyers are not D-I-Y is where middlemen (the professional firms) can play a role in assessing the needs and finding a good fitment. It may also work with the speculative investor class. JM: What according to you is the cardinal problem in the Indian Real Estate arena? SP: The key problem in the Indian real estate segment is the lack of accurate information to make an informed choice. The middlemen while having relatively better information are also handicapped. The only information that they probably have better access to, is availability. The rest is a matter of reverse bidding and price discovery, which middlemen do more efficiently than end users. CAPEXIL, a non-profit organisation by the Ministry of Commerce, Government of India has coferred an award to RC Golden Granites for export. According to a company statement, a high member jury has recognised RC Golden Granites as best exporter nationally among the companies competed across India. 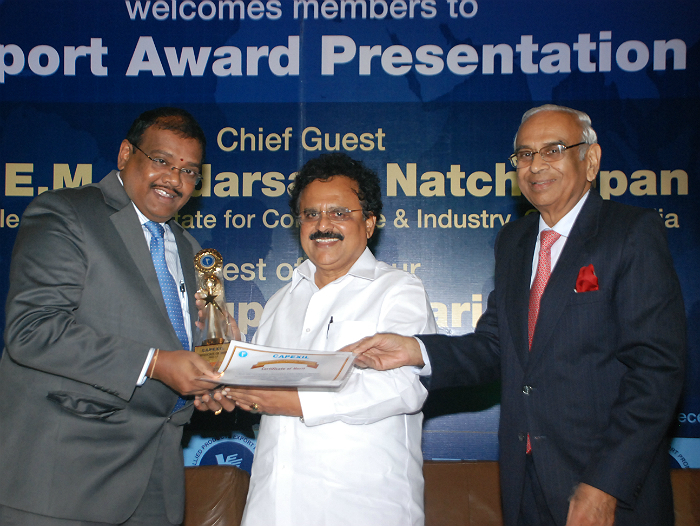 R Chandrasekaran receiving 2011-12 Export REcognition Award from Dr EM Sudarsana Natchiappan. RC Golden Granites, group company of Madurai Appu Hotels, has been bestowed with the award third time in the row – 2008-2009, 2009-2010 and 2011-2012. R Chandrasekaran, CMD, received the award from Dr E M Sudarsana Natchiappan, Minister of State for Commerce and Industry in a glittering ceremony held in Kolkatta.